When storms wreak havoc on your trees, rapid response time and honest advice from our friendly team of tree experts will make the difference in restoring your damaged property. Storm damage tree cleanup services including removing trees from houses, clearing roads, and driveways, and pruning or removal of trees that could lead to personal injury or additional property damage. Here in Maryland ice storms, snow storms, summer thunderstorms and the strong winds associated with them are common. 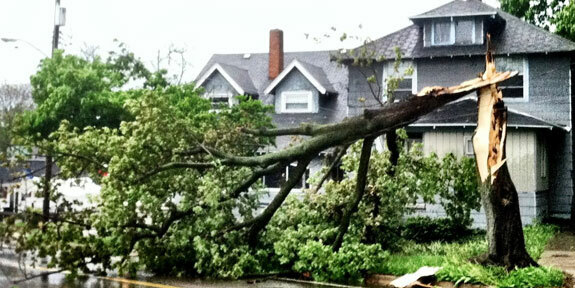 These storms can cause major damage to your trees and property. High winds and heavy ice can break tree limbs and in some cases knock trees down in their entirety. After severe weather has passed, it is important to check your trees for broken branches, limbs with brown leaves, leaning trees and uneven soil at the base where roots have been disturbed. Storm-damaged trees can be extremely dangerous and require highly-skilled and trained climbers and ground crew to safely manage their removal. After a storm, trees often lay in dangerous positions. These trees can be tangled in other trees or structures, and susceptible to unforeseen movement from limbs under heavy presures. Selecting American Tree Service for storm-damage cleanup will provide peace-of-mind that the work will be performed safely and with great care for you and your property. While it is impossible to totally protect your trees and property from severe storms, even if you routinely care for your trees, when a severe storm hits be sure to have an arborist review your property for any issues resulting from the weather.